So, my first week of HRT has passed by faster than I thought it would. There’s not a whole lot to report on at this point in time. The second injection I did completely unassisted this morning, and went very smoothly, so feeling confident about giving myself those now. As far as any changes I’ve noticed this first week goes, they are very small. Things like noticing that my lower range is getting a little easier when I’m singing along to the radio in the car, and that the upper range is starting to tire my throat out more quickly than it used to. In general my throat has felt a little tight or sore, particularly during the second half of the week. My speaking voice seems to have dropped the tiniest bit, but one would only realize it if you hear my day 1 recording compared immediately to the recording I took today (took several to make sure I was saying it in the same tone of voice so that the difference wasn’t just me not saying it the same). That’s to be expected though, from what I understand my voice changing enough that it becomes actually noticeable is still a little ways away. Since the change is so negligible, I think I’ll wait until there’s a more definite change before posting voice recordings. Hmm… what else… Oh man, the last couple days my metabolism seems to have really kicked things up. I seem to still be okay waiting until after class to eat lunch on Monday and Wednesday, since I don’t wake up as early so there’s less time between breakfast and lunch, but Tuesday and Thursday so not the case anymore. I get up significantly earlier on Tuesdays and Thursdays, so the time between breakfast and when I get home from class is probably a good 3 hours longer than Mondays and Wednesdays and now I’m finding that I feel ridiculously hungry well before my classes are over, even though I get home at around the same time all 4 days. Up until starting T, this wasn’t the case and waiting to have lunch wasn’t a big deal. Definitely need to start bringing a lunch with me on Tuesdays and Thursdays now. The most noticeable change for me so far, besides the metabolism thing, has taken place below the belt, which seems to be pretty common from what I’ve read from others taking T. I’m definitely feeling more sensitive there, as well as there seems to be a little growth happening already. Nothing too drastic, but definitely more noticeable than any of the other changes going on so far. I took some measurements today, not because I was expecting changes from T already, but because I’ve been doing an upper body program that one of the coaches at my gym has put together and I’ve gotten some comments on my arms/shoulders lately that I think has to do with that program, especially since all the change has been in my upper body. While I’m eager to see how my body grows and how much strength I gain on T, I don’t expect to really start seeing any significant HRT related muscle gain for at least a couple more weeks, but it is nice to see the progress I’m making from other efforts. I’ve gained about 1 lbs since the Whole30 measurements, and 0.25 inches in my neck, shoulders, and both biceps, as well as 0.5 inches in my chest. My waist, forearms, hips, and legs all stayed the same measurements. 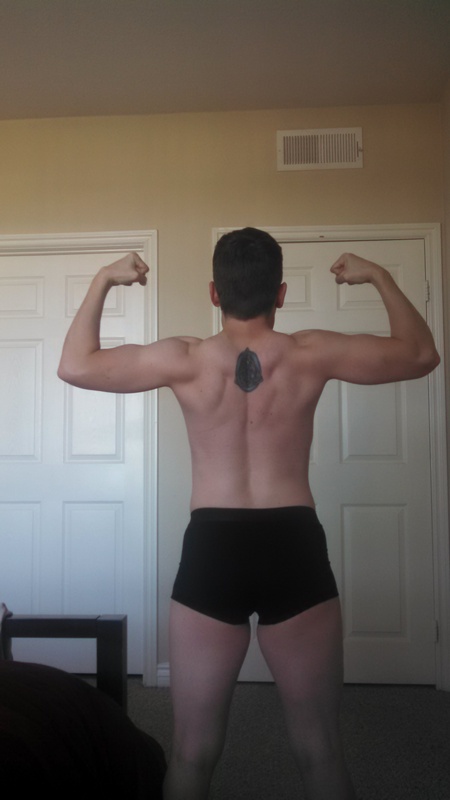 In addition to the change in size, I’ve gained quite a bit of strength in the upper body movements, such as pull ups, handstand push ups, and bench press, amongst others. 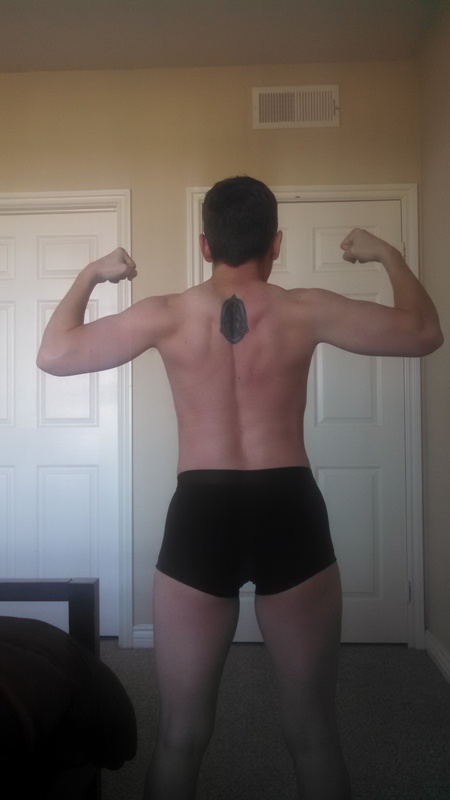 I took some pictures, but the only ones that show any difference are the ones of my back, which makes sense since I think it’s mostly my back and chest that have made the most progress, and my chest gets covered by my hands until I one day get top surgery. So here are those pictures, 3 Feb 2015 on the left and 26 Feb 2015 on the right. I’m only on my 3rd week of this upper body program, but definitely feel like I’ve made a ton of progress thanks to it. So yeah, that about sums things up for this post. I’m sure I’ll have more to write about as the weeks go by and the changes start really taking effect. I’m trying not to let myself be impatient about it or to start imagining changes because I’m looking so eagerly for them. Easier said than done sometimes, but I know they’ll come when they come. It Begins! Also, Thyroid Problems? That’s right, I got my prescription and have taken my first T shot! Driving home from the clinic was actually a very emotional experience for me. I just kept thinking that I couldn’t believe it was actually happening, that they had written the prescription and that I’d be taking my first dose soon. It’s been nearly 2 years since I came out to friends and family, nearly 2 years that I’ve watched August change through HRT and top surgery. Sometimes it was really difficult because I was seeing August go through all these things that I couldn’t even begin until I got out of the military, and other times it was really exciting to be a part of this huge step in his life and to see him feeling so happy and good about himself as his transition progressed. It’s been a rollercoaster, but I knew at the end of it I’d get to start my own journey, hop on to a different ride that I’m sure will be full of it’s ups and downs as well, but this ride will be mine. 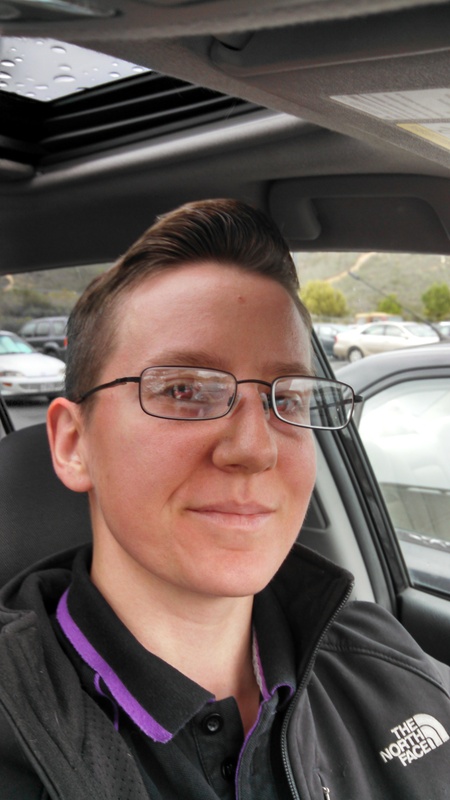 So for 2 years my transition was just a concept, not a real thing, not until I was driving home from the clinic with my prescription and it finally hit me that this was really happening. Yesterday morning I got a call from the clinic saying that my lab results were back and that the doctor wanted me to come in to go over the results with me. This made me really nervous since I had a follow-up appointment set for a couple weeks from now. I thought maybe something came back abnormal in the tests, then I started freaking myself out that if this was the case that it’d delay my starting HRT. Well, I was half right. They called me in because there were a couple things flagged. My cholesterol was on the slightly high side (we expected that since I hadn’t fasted prior to the labs being drawn, so no big deal, the doctor knew that and said it wasn’t something to worry about). The thing they really called me in to talk about was that my thyroid levels (levels of something in my blood that is supposed to activate my thyroid gland’s production of hormones) were a little high, “right on the cusp” is how the doctor put it. I don’t know the full range of normal, but she said 5.5 is the high side of normal and mine came back at 5.8, which means my thyroid may be slightly under active is what she said. Since I’ll be in there every 3 months for lab work to monitor things for my transition, she said they are going to keep an eye on that to make sure it doesn’t get any worse or anything. I looked up the symptoms of hypothyroidism and I do have some mild symptoms (low energy level issues, difficulty remembering things, more difficulty concentrating than I used to have… though I feel like I’m still better at concentrating that others in my classes, amongst other symptoms), so it might be a good idea to look into this when I get new health insurance and a new primary provider once my military health care is over at the end of the month. However, since the symptoms are mild and the levels are only slightly above normal and the doctor herself didn’t seem to think it was enough to keep an eye on but not actually serious at this point in time, I don’t feel overly concerned about it or in a hurry to look into it at the moment so waiting for better insurance isn’t a big deal. Since they called me in early to go over the lab results with me, the doctor went ahead and wrote me the prescription for the testosterone instead of having me come back in a couple weeks for my scheduled follow-up appointment, so that was an awesome plus to having been called in. I wasn’t expecting to get that until March 10th, so that really made my evening. Took my first shot last night, recorded my voice this morning. Couldn’t think of anything clever to say, so just said “This is my voice on my first day of T”. Hopefully I’ll think of something better next time I record it. I’ll post the recording on my next transition related post since I’ll probably have a second recording for comparison to see how it has changed. That’s the biggest thing I’m looking forward to, I usually am identified as male until I speak, so my voice dropping some will help reduce the amount of “Oh, I’m sorry” and trying to correct to female pronouns that I get at the moment. Hopefully my voice will get to a point that matches my appearance better. The other thing I’m looking forward is potentially growing facial hair. We’ll see how that works out, I know not all guys, trans or otherwise, grow it very well, but hopefully I’ll take after my dad and the older of my two younger brothers, in that regard. I figure since it has only been a couple weeks since the post-Whole30 measurements and pictures I took, those will work just fine as my pre-T comparison measurements and pictures. So yeah, hopefully things will progress quickly at first, as they did for August, so I’ll have pretty regular updates to post for a bit. I’m looking forward to the changes I’ll be going through, even though I’m sure some I’ll feel less excited about than others… like going through a second puberty, or body hair in areas such as my back that I’d rather not have too much of. At this point changes of any type I think will be exciting. Anyway, I’ll be documenting everything that I can think of and will post comparisons here as soon as I have some to post. Edit: Talked to some family members after I posted this and learned that hypothyroidism does run in my mom’s side of the family, so it sounds like I’ve inherited that but caught it very early thanks to these pre-HRT labs. Will definitely look into it more once I get the new health insurance and have a primary provider. So we finished the Whole30. It’s been nice to do this sort of reset to start off the new year. I feel like my energy levels are lasting through the day better. As far as physical changes… well the measurements I took before and after, as well as the pictures (before on left, after on right) speak for themselves. I think the measurements tell more than the pictures do. I had a hard time getting pictures that weren’t completely blurry and were close to the same stances I had in the first set of pictures. The lighting is also obviously different, given that one was a set of morning pictures and the other is afternoon pictures (I didn’t have time to take them before I left for class this morning so had to wait until after I got back home). Ultimately, though, I do think I look a lot leaner. I noticed my face in particular looks leaner, though it might be partially because I was in desperate need of a haircut during the first set of pictures. I also think there’s more definition in my abs. 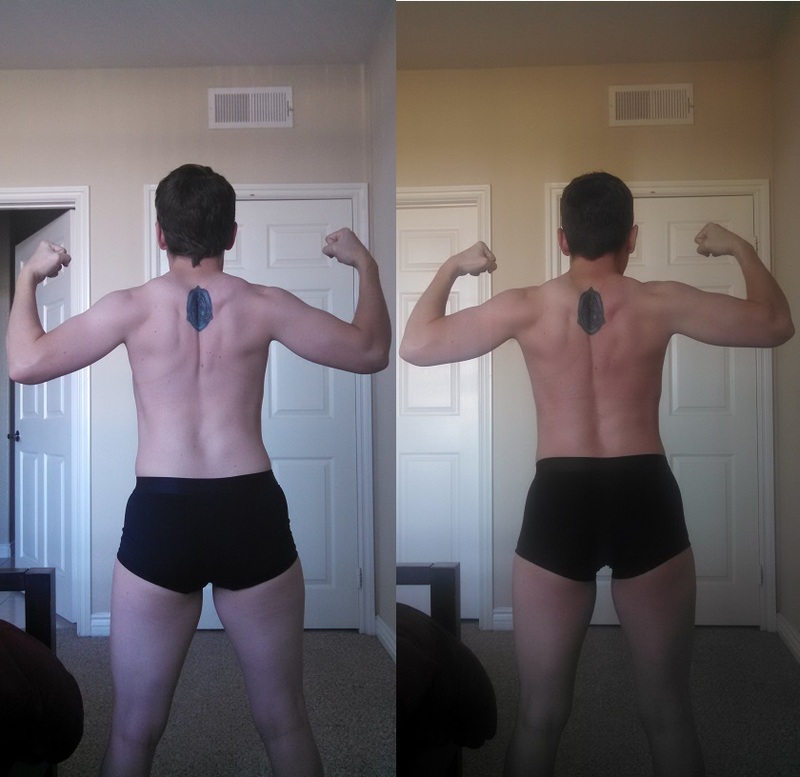 Overall, I lost inches where I wanted to and gained them where I was hoping to gain muscle. We’re planning to stay pretty close to Whole30 as we continue on from here, though not quite as strict. It was good timing for it, since there aren’t too many special occasions or holidays in January, so I think we might make this an annual thing. So I mentioned needing a haircut in the first pictures… It’s been almost a month since I got it, but I got a new haircut. I’ve gotten a ton of compliments on it. One girl at the gym told me several times in one gym session how much she loved it. I’ve even gotten compliments from customers at work who don’t even know me or know that it’s a new hair style. I’ve also been getting identified as male by customers a LOT, sometimes even after I speak. I’ve been getting called sir and was referred to as a gentleman. It seems to be mostly older guys that continue calling me by male pronouns after I speak, while younger ones and most women correct themselves. I can’t wait for my voice to get lower. 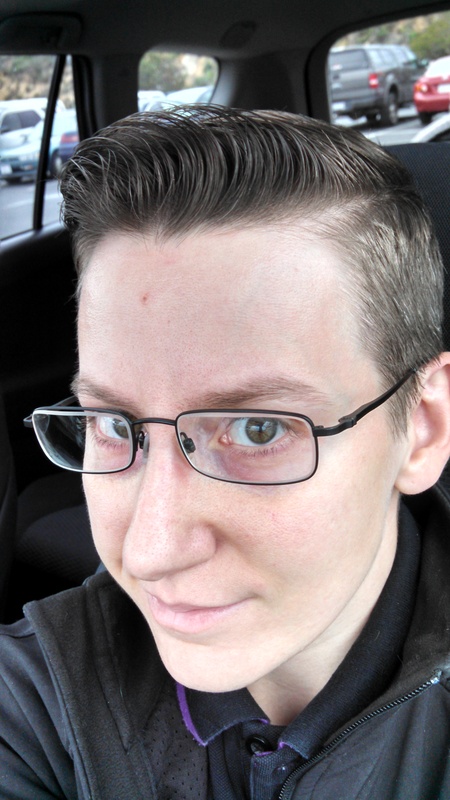 Anyway, below are pictures of the haircut. The first one is right after it was cut, and the next two were just the other day when I was particularly happy with how well it was cooperating. Final bit of news for this post is that today I have my first appointment to begin the process of starting my transition! Today’s appointment is just an orientation at the clinic to go over transitioning to make sure I fully understand what I’m getting myself into, as well as the costs and such. Next week I have an appointment to get blood drawn for the labs. If the labs come back normal, which I don’t see why they wouldn’t, I’ll get my prescription on the third appointment. I’m so excited! As soon as I have that, I’ll start posting more updates with pictures, maybe even voice recordings to document that changing. I’m really looking forward to this, it’s been a long time in coming.